TimeSlotTracker is feature packed free time tracking software that lets you keep track of the time you spend on various activities. You can add the tasks that you are working on, then update it when you finish the task. Start any activity and then you can minimize or close the program; the counter will be running in the system tray without disturbing you. You can set a timer that reminds you if you have not added any activity update for a certain time duration. You can create sub-tasks also of tasks, to record time in a more granular way. You can also generate the reports of tasks. What makes TimeSlotTracker better than other popular time tracking software is that you can add the attributes and description of the tasks with it. Even if you forget to add any activity when it starts, there’s no need to panic. You can easily add it later, and alter its time. In addition to that, it can also take screenshots of your PC regularly, so that you know (or your boss knows) what have you been doing on PC. You would think it lets you cheat if it allows you to edit the later on? Well, think again. It takes screenshots of your system discreetly. There is an option of hiding the task as well. It offers you two view options. Both of them follow hierarchical order; according to task–subtask relationship and dates. These viewing options make adding tasks and checking their list really easy. You can add tasks to favorites. This enables you to access these tasks quickly, even if they are buried deep under the hierarchical tree. Easily customizable settings make this software very user-friendly. You also have a search option to find the task, attributes, or task group, if the history of the tasks is too long. You can also decide the length of the history records. Goes without saying that this is a pretty comprehensive time tracking software. If you are looking for something simpler, try LazyCure. You can follow the link given at the end of this review to download the setup of TimeSlotTracker. Setup should be run as administrator for proper installation. 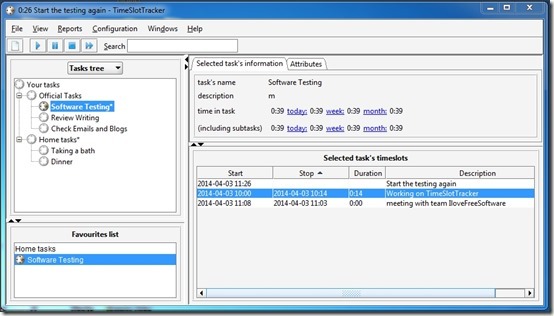 Since it’s Java based application, you must have java installed in your system to use TimeSlotTracker. You need to manually run the application after the installation completes to start tracking. Right-click on “Your Tasks” and a menu will open. You can rename this by choosing “Edit Task” but you can’t delete it, since it is the root task. Click on “Add a new sub-task (child)”. New window will open, which will ask you to add its name, description and attributes of task. Provide the details and click on “Save and exit”. 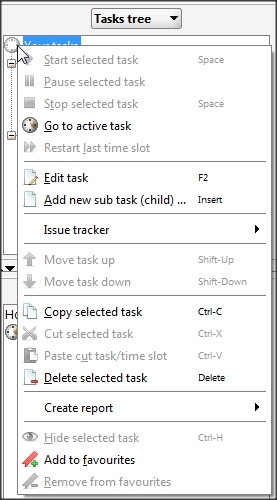 Right Click on the Task which you want to start, and choose “Start Selected task”. A small window will pop-up to confirm task description and Task Name. Edit them if you want and click on Save. The timer will start. Right Click on any time slot on the list. This will open all the time slot editing options. You can choose the desired option to start, stop, pause or restart the timing. You are also allowed to change the time slot’s name, category, description, start and end time. For that you need to click on “Edit selected Timeslot”. Here, you can add the option for taking screenshot of the activity. Just click on add attribute option and choose screenshot. Options to cut, copy, clone or split the time slot are also available in the right-click menu. 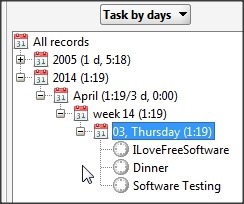 You can choose from two view options: Tasks Tree and Task by Days. Tasks Tree is the default view for the tool. Here you get a hierarchical display of tasks and all the sub-tasks under them. You can use this to: add attributes of task, sub-task, delete task, start task, add them to favorites, hiding a task, etc. To view or hide the hidden tasks, you need to select that option from view. Task by Days lets you view tasks performed on any date. It makes it easy for you to browse the tasks accomplished on particular dates. To view using this option, you must select a date. If you select week or month, then it will not display any task in the list. Click on the Configuration to change the settings. Here, select the options for backup, version updates etc. I’d recommend that you check monitoring options. You can decide the reminder time (it also acts as a timer for screenshots) and how long the history should last. After starting a task, you need to right-click on running timeslot. Click on Add Attribute button and then choose “Screenshot”. It will start taking screenshots from next reminder. For each task, you need to repeat these steps. Click on Reports on Menubar and choose the report that you want. Now “Report configuration” window will popup. Select a title for the report and time period. Select the time period for which you want to get the task reports. Click on “Choose file to save” button and browse to location where you want the report. Click Save. You can also click on “Run Report” in “Report configuration” window to open the report. 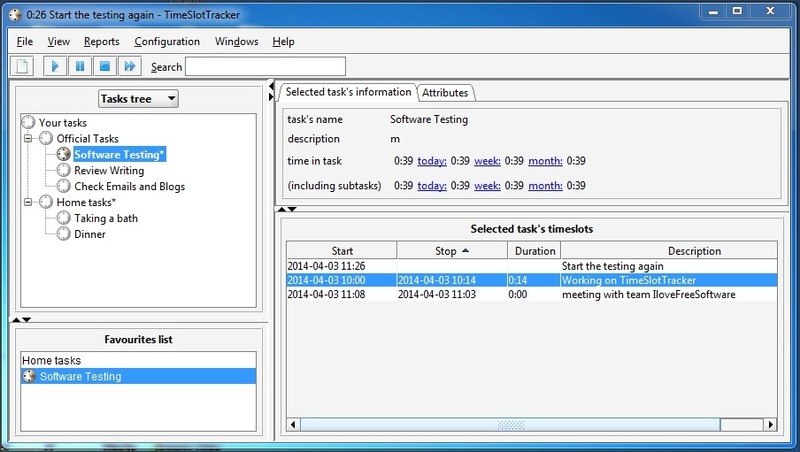 TimeSlotTracker is a very powerful tool for time tracking. It’s loaded with tons of features. Screenshot capture capability is the most effective thing about this tool and Reports option boosts it many folds. If you are in a hurry, you can start the timer with a default description (similar to previous description) and edit it later. You can also use the timeslot splitting option for multiple description of tasks. By default it will divide the slot in two halves, but you still have the choice to change the start and end times. What do you think about TimeSlotTracker? Do let me know in the comments below.